"In an alternative future Japan, junior high students are forced to fight to the death. Koushun Takami's notorious sci fi novel is based on an irresistible premise: a class of junior high school students is taken to a deserted island where, as part of a ruthless authoritarian program, they are provided arms and forced to kill one another until only one survivor is left standing. This runaway bestseller is a Lord of the Flies for the 21st century and a potent allegory of what it means to be young and (barely) alive in a dog-eat-dog world. 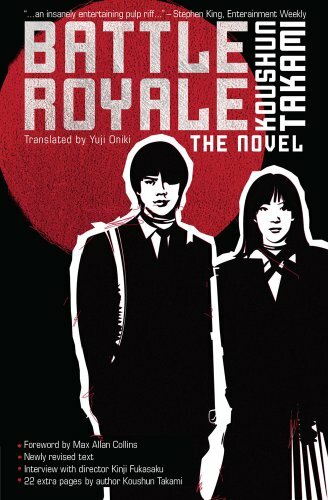 Made into a controversial hit movie of the same name, Battle Royale is already a contemporary Japanese pulp classic, now available in the English language. Koushun Takami's brutal, high-octane thriller is told in breathless, blow-by-blow fashion."